The Leftovers has earned the right to whatever kind of finale it damn well pleases. That feels like an odd thing to say about a television show that topped out at 28 episodes, barely more than many broadcast shows crank out every year. Then again, most television shows that end after 28 episodes have a much different life cycle than The Leftovers. The show grew out of the novel, then became its best self in the off-book second and third seasons, so somehow, ending at this point feels both premature and overdue. Between its aggressive weirdness and anemic ratings, it’s pretty amazing that The Leftovers lasted as long as it did. In the show’s short life span, Tom Perrotta and Damon Lindelof have made a show so confident and powerful, to complain about the way it ended would almost seem ungrateful somehow. And because The Leftovers is about a world full of questions without easy answers, there’s not as much pressure for the finale to serve as a laundry list of resolutions or to dutifully flesh out chunks of its mythology. (To drive the point home, Iris Dement’s “Let The Mystery Be” reappears as the final opening credits theme.) Unlike the last installment of Lost, which came at the end of a six-season high wire act, it was much harder for Lindelof to mess up the finale of a show that has trained its audience to expect nothing and appreciate everything. It’s not a matter of lowered expectations or blind fandom. By making a show so brave and mysterious Lindelof and Perrotta put themselves in a position to create a series finale that is, to some extent, self-validating. 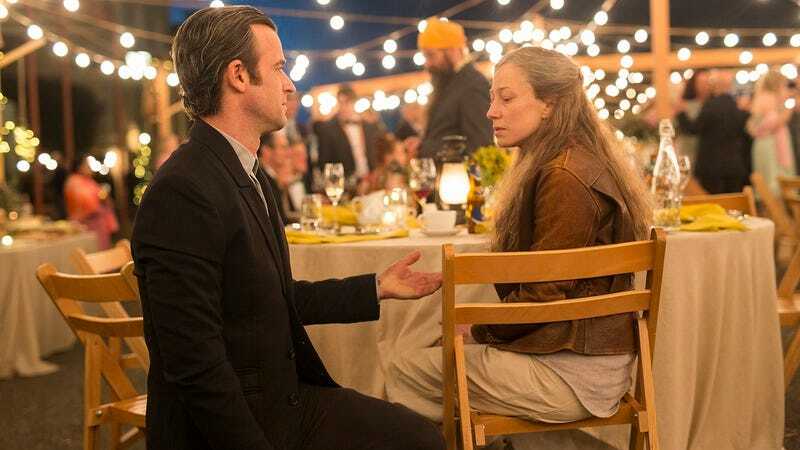 All that said, “The Book Of Nora” will satisfy far more fans of The Leftovers than those who have fallen in love with the characters and are happy to go along for the ride no matter the destination. This is a finale likely to satisfy even those with the most stringent standards, those who have been nervous about how a show as broad and far-reaching as this one could possibly conclude in an appropriate way. Quite simply, it’s one of the best series finales I’ve ever seen, and one that cements The Leftovers as one of the finest drama series in recent memory. As its bookended title suggests, “The Book Of Nora” is all about Nora Durst, who last we saw preparing to embark on a journey to the other side to hopefully reunite with her children. By the time we join her, Nora has already figured out how to overcome whatever objections Drs. Eden and Bekker had to sending her through their radiation portal. She follows the protocol, including the final will and testament committed to videotape to indemnify the rogue doctors. She says her goodbyes to Matt, who is reasonably terrified of the whole prospect but supports his sister and understands more than anyone the desire to leave the world on your own terms. Nora listens to the details of the procedure, which are so terrifying I half-expected her to change her mind. Instead, she climbs into the tank and holds her breath while the chamber fills up with the mysterious liquid that will help zap her beyond this dimension. From there, the episode cuts to “Sarah,” the weathered Australian dove wrangler we first met at the end of “Don’t Be Ridiculous.” She claims not to know anyone named Kevin, but the nun to whom “Sarah” delivers a flock of doves says Kevin’s looking for her, so she’s not completely surprised when Kevin Garvey turns up at her door asking for Nora Durst. But she is surprised by the story he tells her. Kevin claims he’s a tourist hanging out in Australia with his father and that he just happened to run across Nora in his off-the-beaten-path travels and remembered her from Mapleton, where he still allegedly lives and works as the chief of police. Kevin invites Nora to a dance, and after a brief phone consultation with Laurie, who is very much alive, reluctantly accepts the invitation. One of the remarkable things about “The Book Of Nora” is how small it is, how it doesn’t try to accomplish everything, visit every character, detail the fate of the Guilty Remnant, or determine whether the U.S. government has been infiltrated by murderous dog people. It’s a story about a man and a woman, and a love story that has spanned years, continents, dimensions, and states of consciousness. And despite all that history, Kevin is willing to pretend it doesn’t even exist just to have another moment of tender intimacy with the love of his life. Even now, Kevin and Nora are different from each other in many ways, so while Kevin finds peace in the improvisation, Nora is driven crazy by it. She doesn’t want it if it isn’t real. Kevin returns to Nora’s farm to confess the truth. He remembers everything they went through together, as well as the intense pain he experienced when he was told she had gone to the other side. He refused to believe that Nora was gone, and had spent every moment he had free looking for her in Australia. Nora explains where she’s been, and why she never let him know when she returned. As it turns out, the radiation machine zapped her to the other side as promised. But when she got there, all she found was an exact replica of the world, but one in which 98 percent of the world’s population had vanished, just as 2 percent vanished in the world we’ve been watching all this time. She found her family, but realized she had been replaced. Her husband and children were happy in spite of the circumstances, because by only losing one member of their family, they’re considered the lucky ones on their side of the dimensional divide. Had “The Book Of Nora” just consisted of the interactions between Kevin and Nora, it would have still been perfect. But the script goes so far as to let Kevin quickly detail Matt’s funeral and provide updates on what’s happening with the many characters who don’t make appearances in the episode. If anything, “The Book Of Nora” might go a little too far with the punctuation. But man, there’s so little to complain about in the final episode of a show that takes the biggest, most terrifying questions and turned them into a sweeping love story. Kevin has a pacemaker now, that part is true, so he’s not death proof after all. The multiple drownings couldn’t have helped his cardiovascular health. Amy Brenneman isn’t in the episode for long, but she makes good use of the few minutes she has. Otis Redding’s “I’ve Got Dreams To Remember” is yet another fine addition to The Leftovers’ excellent music collection. Just a perfect choice. If Nora’s experience represents the “other side” with regard to the Sudden Departure, then Kevin has been going someplace much, much different. What and where is that place? I suppose we’ll never know, but I’m good with that. Loved Nora’s casual invitation for tea following Kevin’s breathless speech about how long he’s been trying to find her. The final shot of the doves returning killed me dead. Thanks for reading, it’s been awesome to write about this show.